Expats are expanding their horizons in the Medellín valley and turning it into a broad, well-rounded destination with plenty of varied options. Granted, Medellín’s long-trendy El Poblado neighborhood is still the big draw for tourists, business travelers, and expats alike. 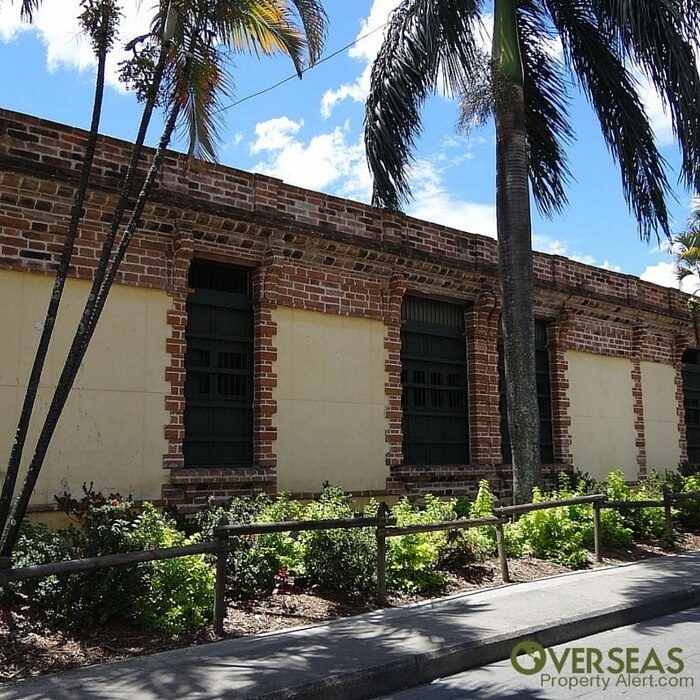 But over the past few years, American and Canadian expats have branched out into a number of other attractive neighborhoods, such as Laureles and Conquistadores. But the most popular new discovery by many expats is Envigado. 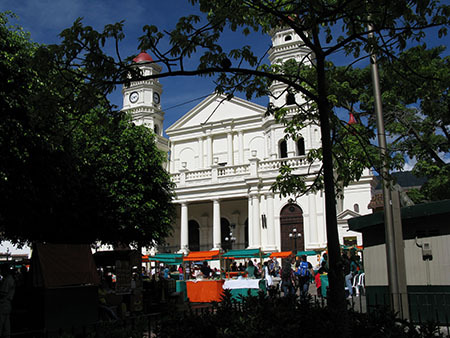 The municipality of Envigado lies south of Medellín, adjacent to El Poblado. And while El Poblado is a neighborhood (comuna) of Medellín, Envigado is not part of Medellín at all… but rather a separate municipality within the Medellín metro area. And Envigado is not only separate administratively, but it also has a character that’s quite different from neighboring El Poblado. Instead of the upscale feel of El Poblado, Envigado seems more like a comfortable, well-maintained, and older-fashioned Latin American city. When I walk around its quiet, tree-lined streets, I find it has a distinctive “neighborly” or “community” feel. The neighborhoods of neat, one- and two-story homes remind me in many ways of the nicer sections of Montevideo, Uruguay. But not far away, standing on the corner of Diagonal 32B and Transversal 34 Sur, I could look all directions and see quiet, tree-lined streets lined with one and two story homes… with the occasional low-rise apartment building here and there. And you’ll get the same feeling from Diagonal 33, a nice residential street divided by planters filled with tropical flowers and trees. So while Envigado indeed has a few neighborhoods of high-rises reminiscent of El Poblado, it also offers a generous quantity of these quiet neighborhoods of single-family homes… which can be difficult to find in El Poblado. When I arrived at Envigado’s Barrio Jardines, I stood on the corner just a block from the main avenue and looked down the tree-lined street. In this hidden-away corner of town, six restaurants lay behind me, along the way back to the avenue. To my left, there were seven more hidden among the trees, in this cool, relaxing setting. This new and already-popular restaurant zone consists of just a few streets, located between Calle 30 and 31 Sur, on Carrera 44a only a block west of the main thoroughfare of Avenida El Poblado. There’s been a single restaurant at this location for more than 30 years (El Trifásico). 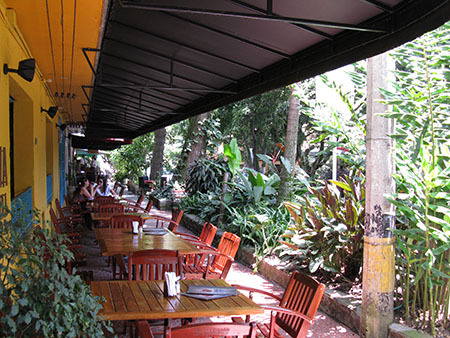 But this small area began to change to a bona-fide destination over the past four years, when entrepreneur Ricardo Restrepo—along with a number of associates—opened several additional restaurants and formed the Corporación Jardines, a company dedicated to the promotion and development of this tiny corner of Envigado. His plan worked… as evidenced by the number of people who make their way here each day. This mini-sector is symbolic of how Envigado is coming into the limelight as a popular residential option for expats and Colombians alike. Envigado is not undiscovered, but it has still maintained its relatively low prices. It’s a good value for a pleasant, neighborly living environment with a smaller town feel. Remember, real estate in Colombia trades in Colombian pesos, not dollars. For convenience, I’ve converted prices at today’s exchange rate. I surveyed a dozen Envigado apartment listings today (all the listings they had on my preferred website) and found the average cost-per-square meter to be only US$934, at today’s exchange rate of 3165 pesos per U.S. dollar. This is down into serious-bargain territory, and it’s a good bit less than El Poblado. But the truth is that you can’t compare the two… Medellín’s El Poblado is a world-renowned, high-end destination, while Envigado is a lesser known, charming Latin American city with somewhat more of a Latin American feel and character. There’s a nearly new three-bedroom apartment, well located at just five minutes’ walk from Parque Envigado, the town square. This fifth floor property has 1,151 square feet (107 square meters) of living area with three bedrooms, two bathrooms, and green mountain views to the north. Building amenities include gym, solarium, garage space, sauna, and steam room. The asking price is US$101,106 (320 million pesos). A large and modern condo (1,507 square feet, 140 square meters) on the 18th floor of a high-rise sitting at the Envigado/El Poblado border has one of the best views in the valley. The unit is quite spacious for a two bedroom, and the balcony looks over a green reserve housing colorful parrots that do daily fly-bys. The building offers an indoor/outdoor pool, sauna, and great location, just minutes from two major supermarkets and a specialty retail mall. The asking price is US$157,977 (500 million pesos). Have a look at the property photos here. If apartment dwelling is not your style, Envigado also has a nice selection of single family homes. Here are a couple on the market today. A three-bed, four-bath, two-story home in a quiet Envigado location has 2,453 square feet (228 square meters) of bright and spacious living area. Built in 2011, this property has modern architecture with advanced ecological design and construction. The asking price is USD$205,371 (650 million pesos). We also found a townhome in a central location, yet with a country-living feel. The property has 1,441 square feet (134 square meters) of living area, with four bedrooms, five bathrooms, a backyard and garage. The 11-year-old complex includes a swimming pool, gym, and 24-hour gated security with low HOA and taxes. The asking price is USD$123,223 (390 million pesos). For information on real estate in Envigado, contact Rich Holman of First American Realty Medellín. You can contact Rich here, and he’ll get right back to you. Is Envigado Right For You? If you plan to rent your property when not in residence, you can do so in Envigado… but it will not produce the high rental returns or occupancies that you’ll see in Medellín’s El Poblado. I’d recommend Envigado for those who are more interested in being part of the community… I’d stick to El Poblado if rental income is your main priority. If you’d like a pleasant South American city that’s only 10 minutes’ drive from all the restaurants and amenities of Medellín’s El Poblado—with a friendly feel, and lower property prices—then Envigado is a must-see stop on your next trip to the Medellín valley. My wife and I were just in Medellín and were ready to buy an apartment in the Campestre district until we heard about Colombia taxing world-wide income for residents (people in country over 183 days in a calendar year). We put off buying until we could get more information on the tax issue. What can you tell us about this since we will be living off my pension that is already taxed in the U.S.? There’s no need to worry about your pension, unless it’s a fairly big one. There’s a pension exemption in Colombia of 29,753,000 pesos per month for 2016 (it goes up every year). At today’s exchange rate of 3165 pesos per U.S. dollar, that works out to an (individual) pension exclusion of about US$9,400 per month. Beyond this amount, the pension gets added to your taxable income. But the minimum tax bracket starts at US$10,200 (annually) at today’s exchange rate. So your pension would need to exceed the monthly exclusion of US$9,400 by an additional US$850 per month before it becomes subject to the first (19%) tax bracket. I’m thinking of moving to Columbia (sic) or the Dominican Republic. I want to rent for a year and then decide whether or not to buy. I am looking for a cheap but good rental property. I take pictures and write informative articles. Besides that I am basically retired and receiving a pension. I do have a cat, and cargo van. Lee, do you have any ideas for me? Thanks. First off, before you consider any other factors, I’d look at the Dominican Republic if you’re looking for a beach lifestyle and fairly hot weather all year. Consider Colombia if you want the option of having somewhat cooler weather (all year) in a mountain environment. Here in Medellín, the high temperatures usually run around 80˚ (27˚C) with lows around 60˚ (16˚C). Colombia also has a Caribbean coast, where the most popular expat destinations are Cartagena and Santa Marta. If you’re still undecided, I’d plan a trip to both. I can guarantee you that either the DR or Colombia will “jump right out” at you. For a rental property in the DR, contact Rico Pester in the Las Terrenas area, as well as for the area along the southern coast from Santo Domingo to Punta Cana. For rentals in the Medellín area in Colombia, contact The Apartment Medellín… in Cartagena, try Cartagena First American Realty. You’ll have no problem with your cat in either place, but you’ll have a problem with the cargo van in both places… I’d recommend leaving that behind. A word of caution, though… you’re banned from obtaining Colombian residency if you spell Colombia with a “u,” like the river.